Thinking and reasoning are key activities for human beings. In this book a distinguished set of contributors provides a wide readership with up-to-date scientific advances in the developmental psychology of thinking and reasoning, both at the theoretical and empirical levels. The first part of the book illustrates how modern approaches to the study of thinking and reasoning have gone beyond the Piagetian legacy: through the investigation of avenues previously not explored, and by demonstrating that young children have higher capacities than was assumed within the Piagetian tradition. The second part focuses upon theoretical and empirical investigations of the interplay between logic and intuition in reasoning and decision making, and how these forms of thinking evolve with age, through the general framework of what is known as dual-process theories. Contrary to Piaget’s claim, it becomes apparent that elaborate adult reasoning could rely on some form of intuition. The Development of Thinking and Reasoning provides psychologists, educators and everyone interested in child development with an integrated and up-to-date series of chapters, written by prominent specialists in the areas of thinking, reasoning, and decision making. 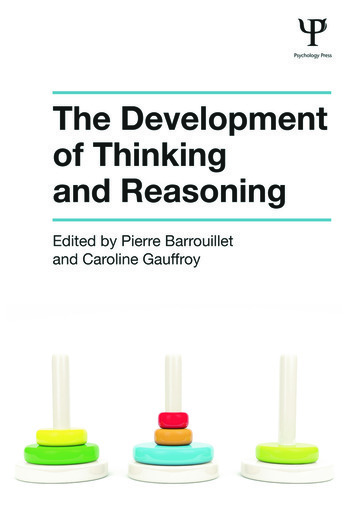 Pierre Barrouillet & Caroline Gauffroy Introduction: From Piaget to Dual-Process Theories: The Complexities of Thinking and Reasoning Development. PART 1: Thinking and Reasoning: Beyond Piaget's Conceptions. David Moshman Epistemic Cognition and Development. Julie E. Meehan & Ruth M.J. Byrne The Development of the Rational Imagination: How Children Create Counterfactual Alternatives to Reality. Usha Goswami The Development of Reasoning by Analogy. Henry Markovits The Development of Abstract Conditional Reasoning. PART 2: Dual-Processes Approaches. Pierre Barrouillet & Caroline Gauffroy Dual Processes and Mental Models in the Development of Conditional Reasoning. Kinga Morsanyi & Simon J. Handley Heuristics and Biases – Insights from Developmental Studies. Paul Klackzynski Culture and Developments in Heuristics and Biases from Preschool through Adolescence: Challenges and Implications for Social development. Valerie F. Reyna Intuition, Reasoning and Development: A Fuzzy-Trace Theory. Carlos F. Gomes & Charles J. Brainerd Dual Processes in the Development of Reasoning: The Memory Side of the Theory. Pierre Barrouillet is Professor of Developmental Psychology at the University of Geneva, and Director of the Archives Jean Piaget. His research investigates the development of numerical cognition, conditional reasoning, as well as the functioning and development of working memory. Caroline Gauffroy is a postdoctoral assistant at the University of Geneva. Her main research interests concern conditional reasoning, propositional reasoning and development.